For the place, see Avocado, California. For the music album, see Pearl Jam (album). The avocado (Persea americana), a tree with probable origin in South Central Mexico, is classified as a member of the flowering plant family Lauraceae. The fruit of the plant, also called an avocado (or avocado pear or alligator pear), is botanically a large berry containing a single large seed. Avocados are commercially valuable and are cultivated in tropical and Mediterranean climates throughout the world. They have a green-skinned, fleshy body that may be pear-shaped, egg-shaped, or spherical. Commercially, they ripen after harvesting. Avocado trees are partially self-pollinating, and are often propagated through grafting to maintain predictable fruit quality and quantity. In 2017, Mexico produced 34% of the world supply of avocados. 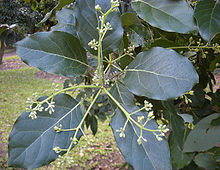 Persea americana is a tree that grows to 20 m (66 ft), with alternately arranged leaves 12–25 cm (4.7–9.8 in) long. Panicles of flowers with deciduous bracts arise from new growth or the axils of leaves. The flowers are inconspicuous, greenish-yellow, 5–10 mm (0.2–0.4 in) wide. The species is variable because of selection pressure by humans to produce larger, fleshier fruits with a thinner exocarp. The avocado fruit is a climacteric, single-seeded berry, due to the imperceptible endocarp covering the seed, rather than a drupe. The pear-shaped fruit is 7–20 cm (2.8–7.9 in) long, weighs between 100 and 1,000 g (3.5 and 35.3 oz), and has a large central seed, 5–6.4 cm (2.0–2.5 in) long. Persea americana, or the avocado, possibly originated in the Tehuacan Valley in the state of Puebla, Mexico, although fossil evidence suggests similar species were much more widespread millions of years ago. However, there is evidence for three possible separate domestications of the avocado, resulting in the currently recognized Mexican (aoacatl), Guatemalan (quilaoacatl), and West Indian (tlacacolaocatl) landraces. The Mexican and Guatemalan landraces originated in the highlands of those countries, while the West Indian landrace is a lowland variety that ranges from Guatemala, Costa Rica, Colombia, Ecuador to Peru, achieving a wide range through human agency before the arrival of the Europeans. The three separate landraces were most likely to have already intermingled[a] in pre-Columbian America and were described in the Florentine Codex. The earliest residents were living in temporary camps in an ancient wetland eating avocados, chilies, mollusks, sharks, birds, and sea lions. The oldest discovery of an avocado pit comes from Coxcatlan Cave, dating from around 9,000 to 10,000 years ago. Other caves in the Tehuacan Valley from around the same time period also show early evidence for the presence of avocado. There is evidence for avocado use at Norte Chico civilization sites in Peru by at least 3,200 years ago and at Caballo Muerto in Peru from around 3,800 to 4,500 years ago. The native, undomesticated variety is known as a criollo, and is small, with dark black skin, and contains a large seed. It probably coevolved with extinct megafauna. The avocado tree also has a long history of cultivation in Central and South America, likely beginning as early as 5,000 BC. A water jar shaped like an avocado, dating to AD 900, was discovered in the pre-Incan city of Chan Chan. The earliest known written account of the avocado in Europe is that of Martín Fernández de Enciso (circa 1470–1528) in 1519 in his book, Suma De Geographia Que Trata De Todas Las Partidas Y Provincias Del Mundo. The first detailed account that unequivocally describes the avocado was given by Gonzalo Fernández de Oviedo y Valdés in his work Sumario de la natural historia de las Indias [es] in 1526. The first written record in English of the use of the word 'avocado' was by Hans Sloane, who coined the term in 1669, in a 1696 index of Jamaican plants. The plant was introduced to Spain in 1601, Indonesia around 1750, Mauritius in 1780, Brazil in 1809, the United States mainland in 1825, South Africa and Australia in the late 19th century, and Israel in 1908. In the United States, the avocado was introduced to Florida and Hawaii in 1833 and in California in 1856. Before 1915, the avocado was commonly referred to in California as ahuacate and in Florida as alligator pear. In 1915, the California Avocado Association introduced the then-innovative term avocado to refer to the plant. The word "avocado" comes from the Spanish aguacate, which in turn comes from the Nahuatl word āhuacatl [aːˈwakat͡ɬ], which goes back to the proto-Aztecan *pa:wa which also meant "avocado". Sometimes the Nahuatl word was used with the meaning "testicle", probably because of the likeness between the fruit and the body part. The modern English name comes from an English rendering of the Spanish aguacate as avogato. The earliest known written use in English is attested from 1697 as "avogato pear", a term which was later corrupted as "alligator pear". Because the word avogato sounded like "advocate", several languages reinterpreted it to have that meaning. French uses avocat, which also means lawyer, and "advocate" — forms of the word appear in several Germanic languages, such as the (now obsolete) German Advogato-Birne, the old Danish advokat-pære (today it is called avocado) and the Dutch advocaatpeer. In other Central American and Caribbean Spanish-speaking countries, it is known by the Mexican name, while South American Spanish-speaking countries use a Quechua-derived word, palta. In Portuguese, it is abacate. The fruit is sometimes called an avocado pear or alligator pear (due to its shape and the rough green skin of some cultivars). The Nahuatl āhuacatl can be compounded with other words, as in ahuacamolli, meaning avocado soup or sauce, from which the Spanish word guacamole derives. In the United Kingdom, the term avocado pear is still sometimes misused as applied when avocados first became commonly available in the 1960s. Originating as a diminutive in Australian English, a clipped form, avo, has since become a common colloquialism in South Africa and the United Kingdom. It is known as "butter fruit" in parts of India and goes by the name bơ [ɓɘː] in Vietnamese, which is the same word that is used for butter. In eastern China, it is known as è lí (鳄梨; 鱷梨; 'alligator pear') or niú yóu guǒ (牛油果; 'butter fruit'). In Taiwan, it is known as luò lí (酪梨, "cheese pear"). The subtropical species needs a climate without frost and with little wind. High winds reduce the humidity, dehydrate the flowers, and affect pollination. When even a mild frost occurs, premature fruit drop may occur, although the 'Hass' cultivar can tolerate temperatures down to −1 °C. Several cold-hardy varieties are planted in the region of Gainesville, Florida, which survive temperatures as low as −6.5 °C (20 °F) with only minor leaf damage. The trees also need well-aerated soils, ideally more than 1 m deep. Yield is reduced when the irrigation water is highly saline. These soil and climate conditions are available in southern and eastern Spain, Morocco, the Levant, South Africa, Venezuela, Colombia, Peru, parts of central and northern Chile, Vietnam, Indonesia, parts of southern India, Sri Lanka, Australia, New Zealand, the Philippines, Malaysia, Central America, the Caribbean, Mexico, southern California, Arizona, Puerto Rico, Texas, Florida, Hawaii, Ecuador, and Rwanda. Each region has different cultivars. Commercial orchards produce an average of seven tonnes per hectare each year, with some orchards achieving 20 tonnes per hectare. Biennial bearing can be a problem, with heavy crops in one year being followed by poor yields the next. Like the banana, the avocado is a climacteric fruit, which matures on the tree, but ripens off the tree. Avocados used in commerce are picked hard and green and kept in coolers at 3.3 to 5.6 °C (37.9 to 42.1 °F) until they reach their final destination. Avocados must be mature to ripen properly. Avocados that fall off the tree ripen on the ground. Generally, the fruit is picked once it reaches maturity; Mexican growers pick 'Hass' avocados when they have more than 23% dry matter, and other producing countries have similar standards. Once picked, avocados ripen in one to two weeks (depending on the cultivar) at room temperature (faster if stored with other fruits such as apples or bananas, because of the influence of ethylene gas). Some supermarkets sell ripened avocados which have been treated with synthetic ethylene to hasten ripening. The use of an ethylene gas "ripening room", which is now an industry standard, was pioneered in the 1980s by farmer Gil Henry of Escondido, California, in response to footage from a hidden supermarket camera which showed shoppers repeatedly squeezing hard, unripe avocados, putting them "back in the bin," and moving on without making a purchase. In some cases, avocados can be left on the tree for several months, which is an advantage to commercial growers who seek the greatest return for their crop, but if the fruit remains unpicked for too long, it falls to the ground. The avocado is unusual in that the timing of the male and female flower phases differs among cultivars. The two flowering types are A and B. A-cultivar flowers open as female on the morning of the first day and close in late morning or early afternoon. Then they open as male in the afternoon of the second day. B varieties open as female on the afternoon of the first day, close in late afternoon and reopen as male the following morning. Avocados can be propagated by seed, taking roughly four to six years to bear fruit, although in some cases seedlings can take 10 years to come into bearing. The offspring is unlikely to be identical to the parent cultivar in fruit quality. Prime quality varieties are therefore propagated by grafting to rootstocks that are propagated by seed (seedling rootstocks) or by layering (clonal rootstocks). After about a year of growing in a greenhouse, the young rootstocks are ready to be grafted. Terminal and lateral grafting is normally used. The scion cultivar grows for another 6–12 months before the tree is ready to be sold. Clonal rootstocks are selected for tolerance of specific soil and disease conditions, such as poor soil aeration or resistance to the soil-borne disease (root rot) caused by Phytophthora. Commercial avocado production is limited to a small fraction of the vast genetic diversity in the species. Conservation of this genetic diversity has relied largely on field collection, as avocado seeds often do not survive storage in seed banks. This is problematic, as field preservation of living cultivars is expensive, and habitat loss threatens wild cultivars. More recently, an alternate method of conservation has been developed based on cryopreservation of avocado somatic embryos with reliable methods for somatic embryogenesis and reconstitution into living trees. 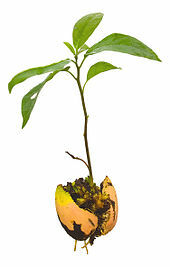 Indoors, an avocado tree is usually grown from the pit of an avocado fruit. This is often done by removing the pit from a ripe, unrefrigerated avocado fruit. The pit is then stabbed with three or four toothpicks, about one-third of the way up from the flat end. The pit is placed in a jar or vase containing tepid water. It should split in four to six weeks and yield roots and a sprout. If there is no change by this time, the avocado pit is discarded. Once the stem has grown a few inches, it is placed in a pot with soil. It should be watered every few days. Avocados have been known to grow large, so owners must be ready to re-pot the plant several times. Avocado trees are vulnerable to bacterial, viral, fungal, and nutritional diseases (excesses and deficiencies of key minerals). Disease can affect all parts of the plant, causing spotting, rotting, cankers, pitting, and discoloration. Mexico is by far the world's largest avocado growing country, producing several times more than the second largest producer. In 2013, the total area dedicated to avocado production was 188,723 hectares (415,520 acres), and the harvest was 2.03 million tonnes in 2017. The states that produce the most are México, Morelos, Nayarit, Puebla, and Michoacan, accounting for 86% of the total. In Michoacán, the cultivation is complicated by the existence of drug cartels that extort protection fees from cultivators. They are reported to exact 2000 Mexican pesos per hectare from avocado farmers and 1 to 3 pesos/kg of harvested fruit. The avocado was introduced from Mexico to California in the 19th century, and has become a successful cash crop. About 59,000 acres (240 km2) – some 95% of United States avocado production – is located in Southern California, with 60% in San Diego County. Fallbrook, California, claims the title of "Avocado Capital of the World" (also claimed by the town of Uruapan in Mexico), and both Fallbrook and Carpinteria, California, host annual avocado festivals. Avocado is the official fruit of the State of California. Hass avocado production in Peru encompasses thousands of hectares in central and western Peru. Peru has now become the largest supplier of avocados imported to the European Union and the second largest supplier to Asia and the United States. A seedling from Miami, Florida. 'Choquette' bore large fruit of good eating quality in large quantities and had good disease resistance, and thus became a major cultivar. Today 'Choquette' is widely propagated in south Florida both for commercial growing and for home growing. A seedling bred from 'Hass' x 'Thille' in 1982, 'Gwen' is higher yielding and more dwarfing than 'Hass' in California. The fruit has an oval shape, slightly smaller than 'Hass' (100–200 g or 3.5–7.1 oz), with a rich, nutty flavor. The skin texture is more finely pebbled than 'Hass', and is dull green when ripe. It is frost-hardy down to −1 °C (30 °F). The 'Hass' is the most common cultivar of avocado. It produces fruit year-round and accounts for 80% of cultivated avocados in the world. All 'Hass' trees are descended from a single "mother tree" raised by a mail carrier named Rudolph Hass, of La Habra Heights, California. Hass patented the productive tree in 1935. The "mother tree", of uncertain subspecies, died of root rot and was cut down in September, 2002. 'Hass' trees have medium-sized (150–250 g or 5.3–8.8 oz), ovate fruit with a black, pebbled skin. The flesh has a nutty, rich flavor with 19% oil. A hybrid Guatemalan type can withstand temperatures to −1 °C (30 °F). A seedling reportedly grown from a 'Taft' avocado planted in Miami on the property of George Cellon, it is named after Cellon's wife, Lula. It was likely a cross between Mexican and Guatemalan types. 'Lula' was recognized for its flavor and high oil content and propagated commercially in Florida. It is also very commonly used as a rootstock for nursery production, and is hardy to −4 °C (25 °F). A relatively new cultivar, it was discovered in South Africa in the early 1990s by Mr. A.G. (Dries) Joubert. It is a chance seedling of unknown parentage. First grown on the Pinkerton Ranch in Saticoy, California, in the early 1970s, 'Pinkerton' is a seedling of 'Hass' x 'Rincon'. The large fruit has a small seed, and its green skin deepens in color as it ripens. The thick flesh has a smooth, creamy texture, pale green color, good flavor, and high oil content. It shows some cold tolerance, to −1 °C (30 °F) and bears consistently heavy crops. A hybrid Guatemalan type, it has excellent peeling characteristics. Developed from a chance seedling found in 1948 by James S. Reed in California, this cultivar has large, round, green fruit with a smooth texture and dark, thick, glossy skin. Smooth and delicate, the flesh has a slightly nutty flavor. The skin ripens green. A Guatemalan type, it is hardy to −1 °C (30 °F). Tree size is about 5 by 4 m (16.4 by 13.1 ft). Developed by a farmer, James Bacon, in 1954, Bacon has medium-sized fruit with smooth, green skin with yellow-green, light-tasting flesh. When ripe, the skin remains green, but darkens slightly, and fruit yields to gentle pressure. It is cold-hardy down to −5 °C (23 °F). Possibly a cross between Mexican and West Indian types, 'Brogden' originated as a seedling grown in Winter Haven, Florida, on the property of Tom W. Brogden. The variety was recognized for its cold-hardiness to −5 °C (23 °F) and became commercially propagated as nursery stock for home growing. It is noted for its dark purple skin at maturity. A Mexican/Guatemalan cross seedling of 'Fuerte', this cultivar originated in Israel, and was put into production there in 1947. Mature trees tolerate four hours at −6 °C (21 °F). The fruit has a smooth, thin, green skin that does not peel easily. The flesh is very pale green. A Mexican/Guatemalan cross originating in Puebla, the 'Fuerte' earned its name, which means strong in Spanish, after it withstood a severe frost in California in 1913. Hardy to −3 °C (27 °F), it has medium-sized, pear-shaped fruit with a green, leathery, easy-to-peel skin. The creamy flesh of mild and rich flavor has 18% oil. The skin ripens green. Tree size is 6 by 4 m (19.7 by 13.1 ft). A Guatemalan/West Indian cross that originated from a seedling grown in Homestead, Florida, on the property of J.J.L. Phillips, it was patented in 1937 and became a major commercial cultivar due to its cold hardiness and production qualities. The fruit is large, averaging over 2 lb (0.91 kg) in weight, has an elliptical shape, and green, glossy skin. Hardy to −3 °C (27 °F). Predominantly Guatemalan, with some Mexican race genes, 'Sharwil' was developed in 1951 by Sir Frank Sharpe at Redland Bay, southern Queensland. The name "Sharwil" is an amalgamation of Sharpe and Wilson (J.C. Wilson being the first propagator). Scions were sent from Australia to Hawaii in 1966. A medium-sized fruit with rough green skin, it closely resembles the 'Fuerte', but is slightly more oval in shape. The fruit has greenish-yellow flesh with a rich, nutty flavor and high oil content (20–24%), and a small seed. The skin is green when ripe. It represents more than 57% of the commercial farming in Hawaii, and represents up to 20% of all avocados grown in New South Wales, Australia. It is a regular and moderate bearer with excellent quality fruit, but is sensitive to frost. Disease and pest resistance are superior to 'Fuerte'. Originated by R.L. Ruitt in Fallbrook in 1926, this Mexican variety is hardy to −4 °C (25 °F). The large, pear-shaped fruit has a shiny, thin, yellow-green skin that peels moderately easily. The flesh is pale green with fibers and has a light flavor. A stoneless avocado, marketed as a "cocktail avocado," which does not contain a pit, is available on a limited basis. They are five to eight centimetres long; the whole fruit may be eaten, including the skin. It is produced from an unpollinated blossom in which the seed does not develop. Seedless avocados regularly appear on trees. Known in the avocado industry as "cukes", they are usually discarded commercially due to their small size. In 2017, world production of avocados was 5.9 million tonnes, led by Mexico with 34% (2.01 million tonnes) of the total (table). Other major producers were Dominican Republic, Peru, Indonesia, and Colombia, together producing 30% of the world total (table). In 2018, the US Department of Agriculture estimated that 231,028 hectares (570,880 acres) in total were under cultivation for avocado production in Mexico, a 6% increase over the previous year, and that 2 million tonnes would be exported. The Mexican state of Michoacán is the world leader in avocado production, accounting for 80% of all Mexican output. Most Mexican growers produce the Hass variety due to its high demand worldwide and longer shelf life. After the North American Free Trade Agreement (NAFTA) went into effect in 1994, Mexico tried exporting avocados to the US. The US government resisted, claiming the trade would introduce Tephritidae fruit flies that would destroy California's crops. The Mexican government responded by inviting USDA inspectors to Mexico, but the US government declined, claiming fruit fly inspection was not feasible. The Mexican government then proposed to sell avocados only to the northeastern US in the winter (fruit flies cannot withstand extreme cold). The US government balked, but gave in when the Mexican government started erecting barriers to US corn. Selling avocados in Santo Domingo, Dominican Republic. 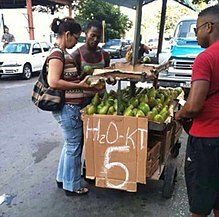 The sign "H2O KT" is a play on aguacate, the Spanish word for avocado. Imports from Mexico in the 2005–2006 season exceeded 130,000 metric tons (143,300 short tons; 127,900 long tons). In the US, avocados are grown in California and Florida, where land, labor, and water are expensive. Avocado trees require frequent, deep watering to bear optimally, particularly in spring, summer, and fall. Due to increased Southern California water costs, they are now costly to grow. California produces 90% of the United States' avocados. As of 2013, Mexico leads international exports, with other significant production in California, New Zealand, Peru, and South Africa. Generally, avocado is served raw, though some cultivars, including the common 'Hass', can be cooked for a short time without becoming bitter. The flesh of some avocados may be rendered inedible by heat. Prolonged cooking induces this chemical reaction in all cultivars. A guacamole mix (right) used as a dip for tortilla chips (left). In the Philippines, Brazil, Indonesia, Vietnam, and southern India (especially the coastal Kerala, Tamil Nadu and Karnataka region), avocados are frequently used for milkshakes and occasionally added to ice cream and other desserts. In Brazil, Vietnam, the Philippines and Indonesia, a dessert drink is made with sugar, milk or water, and pureed avocado. Chocolate syrup is sometimes added. In Morocco, a similar chilled avocado and milk drink is sweetened with confectioner's sugar and flavored with a touch of orange flower water. In Mexico and Central America, avocados are served mixed with white rice, in soups, salads, or on the side of chicken and meat. In Peru, they are consumed with tequeños as mayonnaise, served as a side dish with parrillas, used in salads and sandwiches, or as a whole dish when filled with tuna, shrimp, or chicken. In Chile, it is used as a puree-like sauce with chicken, hamburgers, and hot dogs; and in slices for celery or lettuce salads. The Chilean version of Caesar salad contains large slices of mature avocado. In Kenya and Nigeria, the avocado is often eaten as a fruit alone or mixed with other fruits in a fruit salad, or as part of a vegetable salad. Avocado is a primary ingredient in avocado soup. Avocado slices are frequently added to hamburgers, tortas, hot dogs, and carne asada. Avocado can be combined with eggs (in scrambled eggs, tortillas, or omelettes), and is a key ingredient in California rolls and other makizushi ("maki", or rolled sushi). In addition to the fruit, the leaves of Mexican avocados (Persea americana var. drymifolia) are used in some cuisines as a spice, with a flavor somewhat reminiscent of anise. They are sold both dried and fresh, toasted before use, and either crumbled or used whole, commonly in bean dishes. Leaves of P. americana, Guatemalan variety, are toxic to goats, sheep, and horses. A typical serving of avocado (100 g) is moderate to rich in several B vitamins and vitamin K, with good content of vitamin C, vitamin E and potassium (right table, USDA nutrient data). Avocados also contain phytosterols and carotenoids, such as lutein and zeaxanthin. The avocado tree can be grown domestically and used as a (decorative) houseplant. The pit germinates in normal soil conditions or partially submerged in a small glass (or container) of water. In the latter method, the pit sprouts in four to six weeks, at which time it is planted in standard houseplant potting soil. The plant normally grows large enough to be prunable; it does not bear fruit unless it has ample sunlight. Home gardeners can graft a branch from a fruit-bearing plant to speed maturity, which typically takes four to six years to bear fruit. Avocado leaves, bark, skin, or pit are documented to be harmful to animals; cats, dogs, cattle, goats, rabbits, rats, guinea pigs, birds, fish, and horses can be severely harmed or even killed when they consume them. The avocado fruit is poisonous to some birds, and the American Society for the Prevention of Cruelty to Animals (ASPCA) lists it as toxic to horses. Avocado leaves contain a toxic fatty acid derivative, persin, which in sufficient quantity can cause colic in horses and without veterinary treatment, death. The symptoms include gastrointestinal irritation, vomiting, diarrhea, respiratory distress, congestion, fluid accumulation around the tissues of the heart, and even death. Birds also seem to be particularly sensitive to this toxic compound. A line of premium dog and cat food, AvoDerm, uses oils and meal made from avocado meat as main ingredients. The manufacturer says the avocado's leaves and pit are the source of toxicity, and only in the Guatemalan variety of avocados, and the fruit is often eaten by orchard dogs as well as wildlife such as bears and coyotes. In 1982, evolutionary biologist Daniel H. Janzen concluded that the avocado is an example of an 'evolutionary anachronism', a fruit adapted for ecological relationship with now-extinct large mammals (such as giant ground sloths or gomphotheres). Most large fleshy fruits serve the function of seed dispersal, accomplished by their consumption by large animals. There are some reasons to think that the fruit, with its mildly toxic pit, may have coevolved with Pleistocene megafauna to be swallowed whole and excreted in their dung, ready to sprout. No extant native animal is large enough to effectively disperse avocado seeds in this fashion. ^ "Persea americana Mill., The Plant List, Version 1". Royal Botanic Gardens, Kew and Missouri Botanical Garden. 2010. ^ a b c d e f g h Morton JF (1987). "Avocado; In: Fruits of Warm Climates". Center for New Crops and Plant Products, Department of Horticulture and Landscape Architecture, Purdue University, West Lafayette, IN. pp. 91–102. ISBN 978-0-9610184-1-2. ^ "What's in a name?". University of California. Retrieved March 27, 2016. ^ Chen, H; Morrell, PL; Ashworth, V; de la Cruz, M; Clegg, MT (2008). "Tracing the Geographic Origins of Major Avocado Cultivars". Journal of Heredity. 100 (1): 56–65. doi:10.1093/jhered/esn068. PMID 18779226. ^ a b Storey, W. B. (1973). "What kind of fruit is the avocado?". California Avocado Society 1973–74 Yearbook. 57: 70–71. ^ "Growing avocados: flowering, pollination and fruit set". Government of Western Australia: Department of Primary Industries and Regional Development. ^ Dilip Nandwani (14 October 2014). Sustainable Horticultural Systems: Issues, Technology and Innovation. Springer. pp. 176–. ISBN 978-3-319-06904-3. ^ Chittaranjan Kole (17 August 2011). Wild Crop Relatives: Genomic and Breeding Resources: Tropical and Subtropical Fruits. Springer Science & Business Media. pp. 172–. ISBN 978-3-642-20447-0. ^ Elhadi M. Yahia (27 June 2011). Postharvest Biology and Technology of Tropical and Subtropical Fruits: Açai to Citrus. Elsevier Science. pp. 125–. ISBN 978-0-85709-276-2. ^ A. W. Whiley; B. Schaffer; B. N. Wolstenholme (2002). The Avocado: Botany, Production, and Uses. CABI. p. 30. ISBN 978-0851999784. ^ Frederick B. Essig (3 March 2015). Plant Life: A Brief History. Oxford University Press. pp. 162–. ISBN 978-0-19-026658-5. ^ a b c d Landon, Amanda J. (2009). "Domestication and Significance of Persea americana, the Avocado, in Mesoamerica". Nebraska Anthropologist. 47. ^ a b Galindo-Tovar, María Elena; Arzate-Fernández, Amaury M.; Ogata-Aguilar, Nisao & Landero-Torres, Ivonne (2007). "The avocado (Persea americana, Lauraceae) crop in Mesoamerica: 10,000 years of history" (PDF). Harvard Papers in Botany. 12 (2): 325–334, page 325. doi:10.3100/1043-4534(2007)12[325:TAPALC]2.0.CO;2. JSTOR 41761865. Archived (PDF) from the original on 10 October 2015. ^ a b c d Ayala Silva, Tomas; Ledesma, Noris (2014). "Avocado History, Biodiversity and Production". Sustainable Horticultural Systems. Sustainable Development and Biodiversity. 2. pp. 157–205. doi:10.1007/978-3-319-06904-3_8. ISBN 978-3-319-06903-6. ^ Dillehay, Tom D; Goodbred, Steve; Pino, Mario; Vásquez Sánchez, Víctor F; Tham, Teresa Rosales; Adovasio, James; Collins, Michael B; Netherly, Patricia J; Hastorf, Christine A; Chiou, Katherine L; Piperno, Dolores; Rey, Isabel; Velchoff, Nancy (2017). "Simple technologies and diverse food strategies of the Late Pleistocene and Early Holocene at Huaca Prieta, Coastal Peru". Science Advances. 3 (5): e1602778. doi:10.1126/sciadv.1602778. PMC 5443642. PMID 28560337. ^ Villanueva, M. & Verti, S. "El aguacate: Oro verde de México, orgullo de Michoacán" (PDF). Gobierno del Estado de Michoacán. Retrieved 2007-11-06. ^ Smith, K. Annabelle. "Why the Avocado Should Have Gone the Way of the Dodo". Smithsonian Magazine. The Smithsonian. Retrieved 14 February 2017. ^ Barry, PC (2001-04-07). "Avocado: The Early Roots of Avocado History". Canku Ota. Archived from the original on 2007-12-15. Retrieved 2007-12-29. ^ a b "Avocado History". IndexFresh.com. Bloomington, CA: Index Fresh Avocado. 2007. Archived from the original on 2007-12-25. Retrieved 2007-12-29. ^ a b c Stradley, Linda (2004). "All About Avocados: History of the Hass Avocado". What'sCookingAmerica.net. Newberg, OR: self-published. Retrieved 2008-05-13. ^ Dakin, Karen (1982). La evolución fonológica del Protonáhuatl (in Spanish). México D.F. : Universidad Nacional Autónoma de México, Instituto de Investigaciones Filológicas. p. 210. ISBN 978-968-5802-92-5. OCLC 10216962. ^ "Online Etymology Dictionary". Etymonline.com. Retrieved 2014-02-01. ^ Oxford English Dictionary, second edition (1989), articles "avocado", "alligator, n.2"
^ Svenska Akademiens ordbok, "advokat"; Ordbog over det danske Sprog, "avocado"; Woordenboek der Nederlandsche Taal, "avocado", all meaning "advocate pear". ^ "Avocado". TheFloweringGarden.com. 2007-08-08. Archived from the original on 10 May 2010. Retrieved 2010-05-12. ^ a b "Twiggy squares up to Sainsbury's in the avocado wars". The Scotsman. 23 May 2009. Retrieved 14 February 2017. ^ "Avocado holds promise for Wayanad farmers". The Hindu. 2010-04-16. ^ Whiley, A (2000-09-01). "Avocado Production in Australia". Food and Agriculture Organization of the United Nations. Archived from the original on 12 January 2008. Retrieved 2007-12-29. ^ "Ethylene gas and produce". Mindfully.org. 1976-06-01. Archived from the original on 26 May 2010. Retrieved 2010-05-12. ^ Steve Chawkins (2013-06-03). "Gil Henry dies at 88; revolutionized avocado industry; Henry pioneered the use of a 'ripening room' at his family's Escondido farm. The method, now an industry standard, allows markets to sell fruit that is ready to eat or close to it". Los Angeles Times. Retrieved 2013-06-04. ^ "Agriculture Handbook". University of California. 2007. Archived from the original on 17 December 2007. Retrieved 2007-12-29. ^ Crane, JH; Balerdi CF; Maguire I (2007-08-01). "Avocado Growing in the Florida Home Landscape". University of Florida. Archived from the original on 13 January 2008. Retrieved 2007-12-29. ^ Blumenfeld, Amos; Gazit, Shmuel. "Development of Seeded and Seedless Avocado Fruit" (PDF). Agricultural Research Organization, Volcani Center, Bet-Dagan, Israel. Archived from the original (PDF) on 2014-01-25. Retrieved 2010-09-21. ^ Stewart, W.S. ; Smoyer, K.M. ; Puffer, R.E. "Progress Report on Effects of Plant Growth Regulator Sprays on Avocados" (PDF). California Avocado Society 1948 Yearbook. 33: 113–116. Retrieved 2010-09-21. ^ Boning, Charles (2006). Florida's Best Fruiting Plants: Native and Exotic Trees, Shrubs, and Vines. Sarasota, Florida: Pineapple Press, Inc. p. 33. ^ O’Brien, Christopher, Jayeni CA Hiti-Bandaralage, Alice Hayward, and Neena Mitter. "Avocado (Persea americana Mill.)." In Step Wise Protocols for Somatic Embryogenesis of Important Woody Plants, pp. 305-328. Springer, Cham, 2018. ^ Ohr, H. D.; Coffer, M. D.; McMillan, R. T. (April 8, 2003). "Diseases of Avocado (Persea americana Miller)". The American Phytopathological Society. ^ "2001-2013 World avocado production, 2000-2011 World Avocado Exports,2002-2013 French avocado imports". Novagrim.com. Retrieved 2014-02-01. ^ a b c "Crops/World regions/Production quantity (pick lists) of avocados for 2017". Food and Agriculture Organization of the United Nations, Statistical Division (FAOSTAT). 2018. ^ "Templarios ganan 2,000 mdp al año extorsionando a aguacateros en Michoacán" [Templars earn 2,000 pesos a year extorting avocado in Michoacan] (in Spanish). Aristegui Noticias. 2013-10-29. Retrieved 2014-02-01. ^ "Fresh California avocados". California Avocado Commission. 2019. Retrieved 1 April 2019. ^ a b Clipsham, R. "Avocado Toxicity". Archived from the original on 12 January 2008. Retrieved 2007-12-29. ^ "::Uruapan:: Uruapan, Michoacan, México". Uruapaninteractivo.com. Archived from the original on 2014-02-03. Retrieved 2014-02-01. ^ "California State Foods Named By Gavin Newsom". Huffington Post, San Francisco. 2013-04-25. Retrieved 2015-04-15. ^ "Peru: Record avocado production saturated the markets in 2014". freshplaza.com. ^ "Peru jumps to No.2 avocado exporter to the U.S." Produce Blue Book. 10 January 2019. Retrieved 2019-02-03. ^ a b c "The Hass Mother Tree: 1926–2002". Avocado.org. Irvine, CA: California Avocado Commission. 2008. pp. "About Avocados: History" section. Archived from the original on 13 September 2008. Retrieved 2008-09-27. ^ Overholser, E. L. (1924–25). "Cold Storage Behavior of Avocados" (PDF). California Avocado Association Annual Report. San Diego, CA: California Avocado Association. 10: 32–40. Archived from the original (PDF) on February 16, 2013. Retrieved August 19, 2009. ^ The holy grail of avocados - stoneless - hits shops for a limited time only The Sunday Independent, 2017-12-10. ^ a b c "Mexico; Avocado Annual" (PDF). US Department of Agriculture, Foreign Agricultural Service. 27 November 2018. Retrieved 23 April 2019. ^ "Mexico praises lifting of last U.S. avocado import barriers". International International Herald Tribune. 2007-02-02. Archived from the original on 18 January 2008. Retrieved 2007-12-29. ^ The Associated Press (2007-02-02). "Mexico praises lifting of last U.S. avocado import barriers". International Herald Tribune. Archived from the original on 2008-01-18. Retrieved 2014-02-01. ^ "The productivity connection behind openness" (PDF). Trade and Poverty in Latin America (COPLA). 2009-05-05. Retrieved 2017-02-14. ^ "Avocados: Commodity Fact Sheet" (PDF). California Avocado Commission. 1 February 2019. Retrieved 1 April 2019. ^ Jules Janick, ed. (2008). The Encyclopedia of Fruit & Nuts. Oxforshire, England: CABI. p. 440. ISBN 978-0-85199-638-7. ^ Bates, Robert P (1970). "Heat-Induced Off-Flavor in Avocado Flesh". Journal of Food Science. 35 (4): 478–82. doi:10.1111/j.1365-2621.1970.tb00962.x. ^ Zeldes, Leah A. (2010-06-02). "Eat this! The 'Hass' avocado, black and green and creamy". Dining Chicago. Chicago's Restaurant & Entertainment Guide, Inc. Retrieved 2010-06-20. ^ Diana Kennedy (2010). Oaxaca Al Gusto: An Infinite Gastronomy. University of Texas Press. p. 426. ISBN 978-0-292-72266-8. ^ "Livestock - Poisoning Plants of California, Publication 8398" (PDF). Agriculture and Natural Resources, University of California. November 2010. Retrieved 26 February 2018. ^ a b c d e "Avocados, raw, all commercial varieties, per 100 grams". NutritionData.com. 2013. Retrieved 2013-04-17. ^ Brehler R, Theissen U, Mohr C, Luger T (April 1997). ""Latex-fruit syndrome": frequency of cross-reacting IgE antibodies". Allergy. 52 (4): 404–10. doi:10.1111/j.1398-9995.1997.tb01019.x. PMID 9188921. ^ "Latex allergy". Better Health Channel. Archived from the original on 2011-12-27. Retrieved 2011-12-26. ^ "Avocado - allergy information (InformAll: Communicating about Food Allergies - University of Manchester)". Inflammation-repair.manchester.ac.uk. 2006-10-18. Retrieved 2017-02-14. ^ "Notes on poisoning: avocado". Canadian Biodiversity Information Facility. 2006-06-30. Archived from the original on 14 January 2008. Retrieved 2007-12-29. ^ "Avocado". ASPCA Animal Poison Control Center. ^ Oelrichs, Peter B; Ng, Jack C; Seawright, Alan A; Ward, Annemarie; Schäffeler, Lothar; MacLeod, John K (1995). "Isolation and identification of a compound from avocado (Persea americana) leaves which causes necrosis of the acinar epithelium of the lactating mammary gland and the myocardium". Natural Toxins. 3 (5): 344–9. doi:10.1002/nt.2620030504. PMID 8581318. ^ Greye, Jan; Jesse Smith, Gail (2002). Puppy Parenting: Everything You Need to Know About Your Puppy's First Year. HarperCollins. p. 135. ISBN 978-0-06-001260-1. ^ AvoDerm. "AvoDerm® Why Avocados?". Retrieved August 12, 2013. ^ Cited in Barlow; Connie C. (2000). The ghosts of evolution: nonsensical fruit, missing partners, and other ecological anachronisms. New York: Basic Books. ISBN 978-0-465-00551-2. ^ Nigel-Wolstenholme, B.; Whiley, A.W. (1999). "Ecophysiology of the avocado (Persea americana Mill.) tree as a basis for pre-harvest management". Revista Chapingo Serie Horticultura. 5: 77–88. doi:10.5154/r.rchsh.1999.06.043 (inactive 2019-02-21). Bruce Shaffer; B. Nigel Wolstenhome; Anthony W. Whiley, eds. (2012). The Avocado: Botany, Production and Uses. CABI. ISBN 9781845937010. Wikisource has the text of the 1911 Encyclopædia Britannica article Avocado Pear. This page was last edited on 23 April 2019, at 14:03 (UTC).